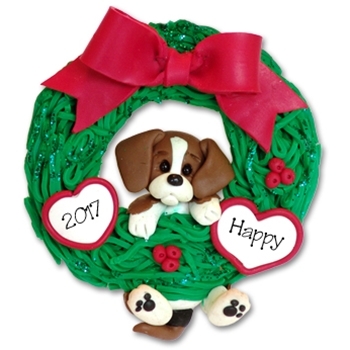 One of Deb's Puppy Pals, Happy the puppy has gotten into some mischief and is hanging from a wreath! This darling ornament may be personalized with a name and date on the hearts. The wreath has been glittered for that special sparkle. This is one of Deb's Limited Edition collectible ornaments. Handmade from Polymer Clay by Deb herself. Comes complete with hooks and satin ribbon for hanging. Choose your favorite or collect them all!